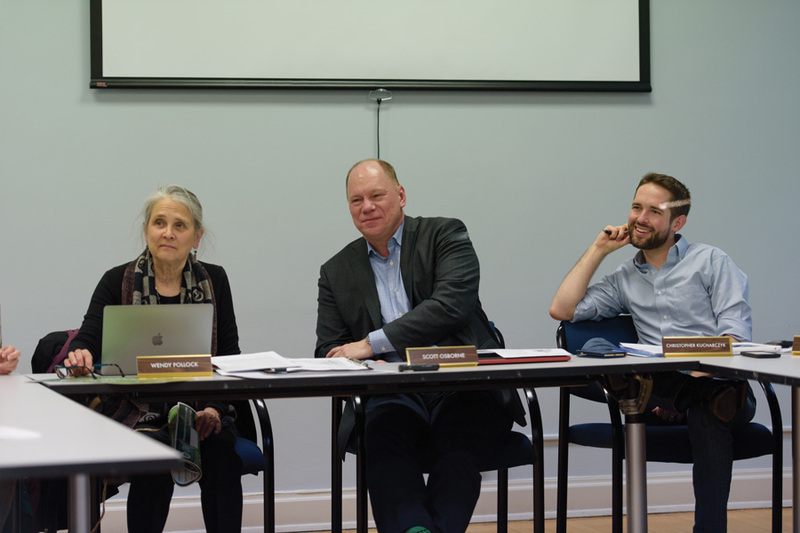 Evanston Environment Board co-chairs Wendy Pollock (left) and Scott Osborne (middle) and board member Christopher Kucharczyk (right) sit at an EEB meeting Thursday. The board discussed a bird habitat enhancement project and a potential road development. The Evanston Environment Board met Thursday to discuss an update on the North Shore Channel Habitat Project and a development in Isabella Woods. Wendy Pollock, co-chair of the board, said the North Shore Channel Habitat Project is funded by a $100,000 grant from the National Fish and Wildlife Foundation’s Chi-Cal Rivers Fund. The project works in coordination with Friends of the Chicago River — an organization focused on revitalizing the Chicago River. The goal of the project is to create and enhance bird habitats in areas along the North Shore Channel such as the Ladd Arboretum, Twiggs Park and Harbert Park, she said. “We’ve been getting volunteers’ interest lined up and have people weeding and transplanting and getting very eager to do more,” she said. The city awarded the grant to the two-year project at the end of December and work began on the channel early this year, Pollock told The Daily. She said the project has been going “really well,” and the program has received support from the city and the community. Pollock said the project builds on past habitat construction projects in Evanston such as the Clark Street Beach Bird Sanctuary, completed in October 2015. Maintaining such sites is important both to migratory birds and to humans, she said. Part of the project also involves repairing channel overlooks at parks that are “choked” with vegetation, Pollock said. On Thursday, the board also discussed a potential road development in Isabella Woods, in northwest Evanston. Evanston resident Joe Brennan said the property is leased to Evanston by the Metropolitan Water Reclamation District. He said the Cook County Department of Transportation and Highways asked the MWRD to build a road through the woods for a housing developer. Libby Hill, an Evanston resident and Perkins Woods steward — a position that involves maintaining the forest preserve — defended preserving the woodlands at the meeting. She said the MWRD is responsible for storm drainage in Cook County, and the woods help divert storm water. Hill said she opposes the road development because the woodlands are “valuable” in keeping stormwater out of the city’s drainage and sewage system. The board formally expressed its support for City Council’s decision to oppose construction of the road. The council will decide whether to act on the opposition at Monday’s meeting, Pollock said.